The scientists and engineers of DARPA (The Defence Advanced Research Projects Agency), the Pentagon's gateway to the technological left field, have struck again. The bulgy-bonced battle boffins have decided to sink some cash into an effort to develop a super-intelligent battle computer system which will enable US soldiers to be invincible in the field. Perhaps impressed by the famous "Deep Blue" and its victories over mere human brains in the mock combat of chess, DARPA's name for its general-in-a-box tech is "Deep Green". The colour presumably alludes to the fact that - at least to start with - the robocommand package is intended to help US Army bird colonels handle their "modular brigade" battle groups. If the project were a British Army one, the project might be known as "Deep Brown" (Or there again, maybe not). As Deep Blue is already taken, future versions for the other US services will presumably be known as Deep Periwinkle (air force) and Actually Deep Blue (navy). According to the DARPA call for ideas (available in full here (pdf), Deep Green will include technologies called "Sketch to Plan and Sketch to Decide", "Crystal Ball", "Automated Course of Action Generation"" and "Blitzkrieg". The idea is that within three years DARPA will be able to run wargames using human headquarters staffs, but that the Deep Green equipped staffs will have only a quarter as many personnel. Performance will be graded by judges who don't know whether a given team was Deep Green equipped or not. It would, of course, be silly to say that Deep Green will take over the US Army's combat units. "Leaders from the field generally do not want machine-generated courses of action," admits DARPA, plainly disappointed after being shouted at by some cigar-chewing US colonels. 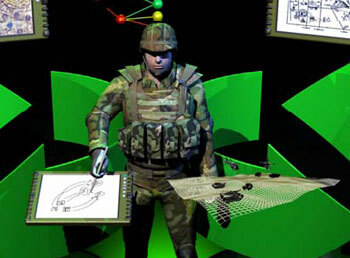 Deep Green is to be "a commander-driven battle command technology". But the boffins have left themselves scope for the machine takeover which we all knew would be inevitable from the start. "The long-term vision of Deep Green is for options to be generated by both the commander and the computer... so that some options are generated by humans and others are generated by machines. Initially, DARPA expects the machine generation of options to be centered on making clever mutations of the human-generated options..."
And from there it's only a short step to getting rid of the human generals and colonels altogether. They can head down to the dole queue with the swarms of annoying staff officers automated out of a job in the early phases.